1) Melt the palm oil in a large pan. 2) Add the crayfish and the stockfish, followed by the dry fish. Mix well. 3) Turn the heat off and continue to mix. Add the potash and mix well. At this point, the mixture will turn a little yellow. If needed, add more potash but ensure that it is not too much. 4) Add the salt and mix well. Taste the mixture at this point and add more salt if needed. 5) Add the maggi cubes and pepper. Stir to mix. Taste to check for seasoning. 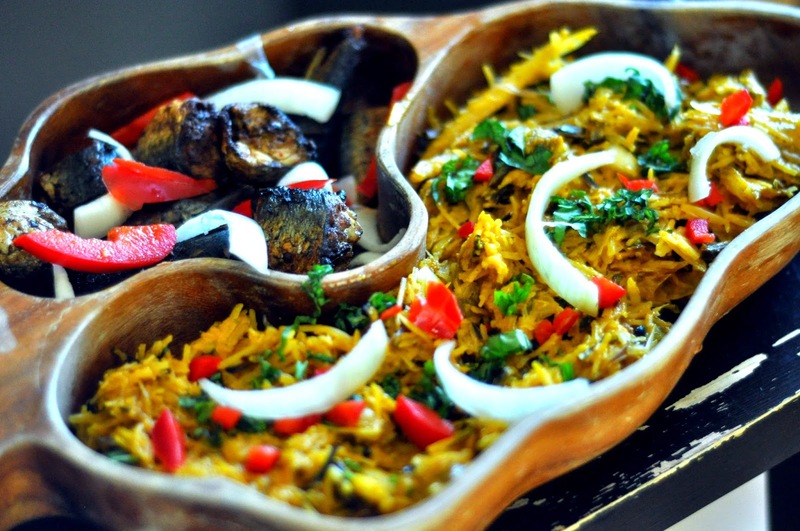 6) Next, add the abacha, mix lightly and then add the ugba. Mix all the ingredients together thoroughly. 7) Add the okazi to the mixture and stir it well. 8) Transfer the salad to a serving bowl, top with chopped onion and serve right away.